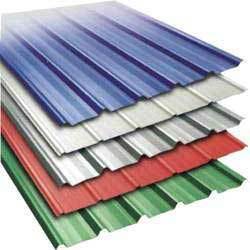 Our expert team is engaged in distributing and selling high quality Galvanised Colour Coated Sheets as per the requirement of the customer. These sheets are available in different sizes & colors. We deal in TATA BLUESCOPE Colour Coated Sheets. HINDUSTAN STEEL CORPORATION was incorporated in the year 1975 at Agra Uttar Pradesh. We are engaged in supplying of a wide range of Steel Products. We are the Dealer of TATA STEEL since last eight years, & Distributor of BARNALA STEEL MUJAFFERNAGAR. Under the guidance of our CEO Shri Harish Chandra Agarwal who has 40 years of experience and proficient knowledge in this domain, we have been scaling new heights of success.